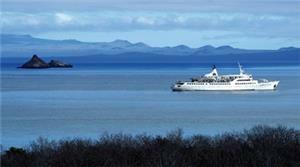 Visit "El Soplador" and see the exotic varieties of wildlife at Suarez Point! Explore Santa Cruz island from top to bottom with trips to impressive lava tunnels, tropical forests, and giant tortoise habitats! Relive history at Post Office Bay, where sailors of old sent letters to their loved ones back home from voyages! Day 2 - Friday: Snorkel, kayak, and safari across Espanola Island, from Gardner Bay's beaches to the slopes of Suarez Point! Day 3 - Saturday: Experience the history of Post Office Bay and a dinghy ride that weaves across the waters through the Devil's Crown and Champion Islet! Day 4 - Sunday: Climb to the highlands for visits to lava tubes, tropical forests, and with giant tortoises! Dry landing. We visit the Station where the Galapagos giant tortoise breeding program takes place as part of our efforts to preserve the fragile Galapagos environment and where the famous Lonesome George (the last surviving specimen of his species) lived for decades. Admire a prickly-pear cactus forest and variety Darwin’s finches and other land birds. 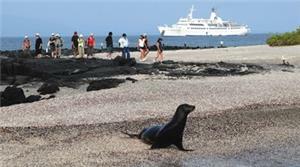 The Darwin Station also works providing environmental education to the communities, schools, and tourists visiting the Galapagos Islands. You will also have some free time to visit the town, Puerto Ayora, and shop for souvenirs. Wet landing. Ballena (Whale) Bay is a beautiful green sand cove at the base of Dragon Hill on the west coast of Santa Cruz Island. The beach contains plenty of olivine crystals of volcanic origin. The crystals were formed when the magma was still underground. The content is magnesium, iron, and silica. A small population of tortoises from Pinzón Island lived at the site but were probably taken by whalers or previous inhabitants. Opportunity to see marine iguanas and sea birds followed by snorkeling. Eden Islet is off the western coast of Santa Cruz, Eden Islet offers opportunities to see Nazca and blue-footed boobies, reef sharks, and banks of endemic bream fish, either from the dinghy or while snorkeling. Day 5 - Monday: Farewell to the Galapagos!